An excellent afternoon of football was enjoyed on Tuesday by pupils and staff alike. Approximately £1,500 has been raised in aid of Hope Gardens India, a fantastic outcome from what proved to be one of the most dramatic matches of the season. We would like to offer our thanks to all staff and pupils who took part and supported the football match. Please see the full match report below by Frederik Markus (P). 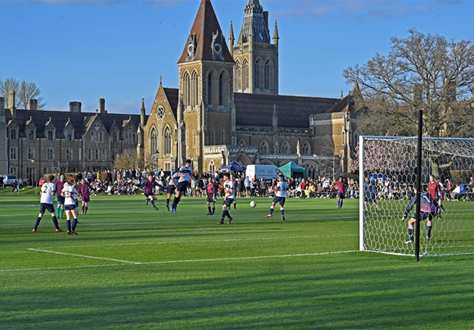 Several hundred pupils and members of staff enjoyed the sunny Tuesday afternoon at the annual School Monitor vs. Brooke Hall Football Match in what has been called: “one of the most relaxed and entertaining afternoons in the recent history of the school”. After a somewhat disputable decision by the referee, the Brooke Hall team missed their early chance to gain the lead with a penalty. This provided the wake-up call for the Monitor team who proceeded to score two quick goals for a 2-0 lead after only 10 minutes. The game continued to be eventful, with constant physicality on both sides (and the referee subjectively seeming to favour the Brooke Hall team) leading to a handful of goal-scoring opportunities on both sides with only one being converted successfully, allowing the BH team to pull one goal back before half-time. In what must be hailed as one of the greatest comebacks in the school’s recent history, the Brooke Hall team managed to exploit the increasing weariness of the monitor team, to score two goals in the span of 10 minutes for a 3-2 lead. A particular mention has to go to Mr. Sutton who, in almost Ronaldinho-esque manner, managed to evade his pursuers again and again to the roaring delight of the now vivacious crowd. The referee must have found a glimpse of sympathy for the now struggling monitors, since they were awarded a somewhat dubious penalty in the dying minutes of the game. The Captain of Football himself confidently stepped up and scored the equaliser for a 3-3 draw after regular time. The subsequent penalty shootout was highly tense with misses on both sides with the score standing at 2-2 after five rounds of penalties. The monitors managed to win by the tightest of margins after Mr. Monroe missed to convert his penalty in the ensuing sudden death shootout. 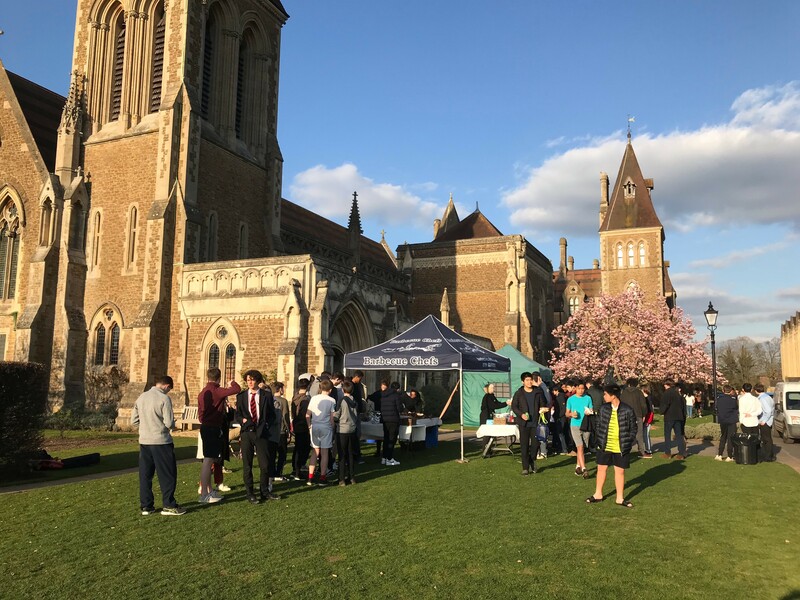 Usually this tradition is limited to a football match, however, this year, the monitors decided to expand the event with the aim to collect money for the school’s current charity (Hope Gardens). The entire week before the game, students and beaks could vote up to five times, with each vote costing £1, to decide who should start in the Brooke Hall line-up. On the day of the match, two food stalls were built up near the pitch and donations were collected as well. In total, more than £1,500 were raised for charity. My thanks goes to all those involved with the organisation and planning of this great afternoon.